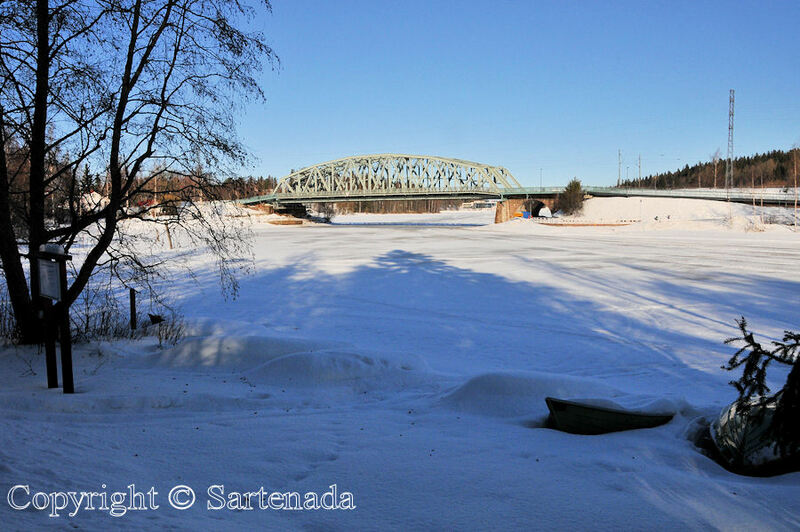 Winter photos of the lake Vanajavesi in Hämeenlinna. 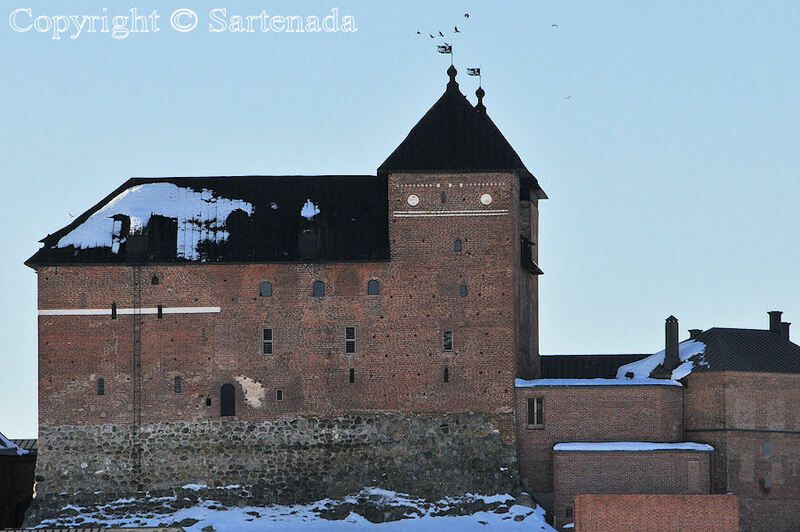 I like to visit in Hämeenlinna many times during the year. 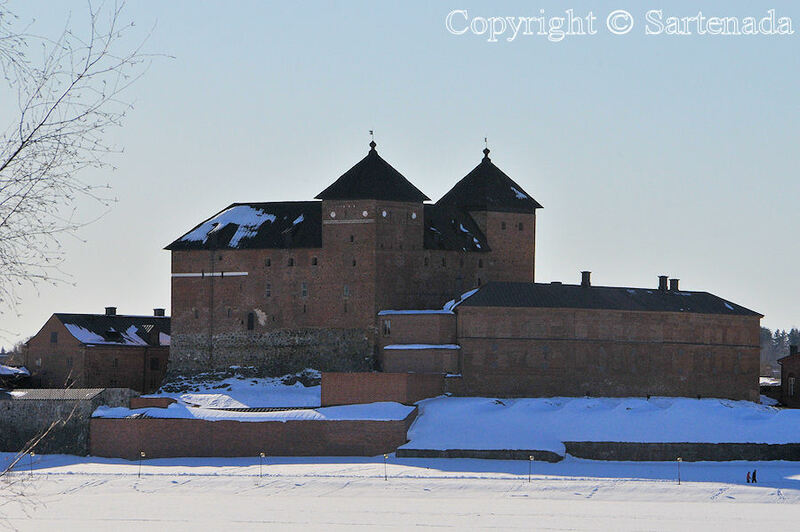 Hämeenlinna is famous for its medieval red brick castle (Castle of Häme) which dominates the overall view of this small town. 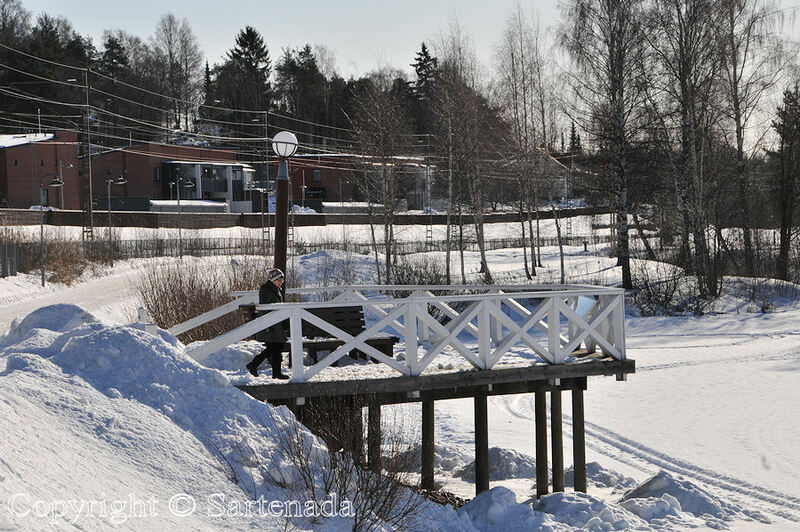 There is nice walking track / path which is passing “around” small part of the lake Vanajavesi. Plenty of people are running or walking around in this scenery, some are simply enjoying the beauty of the landscape with lake view and the castle. 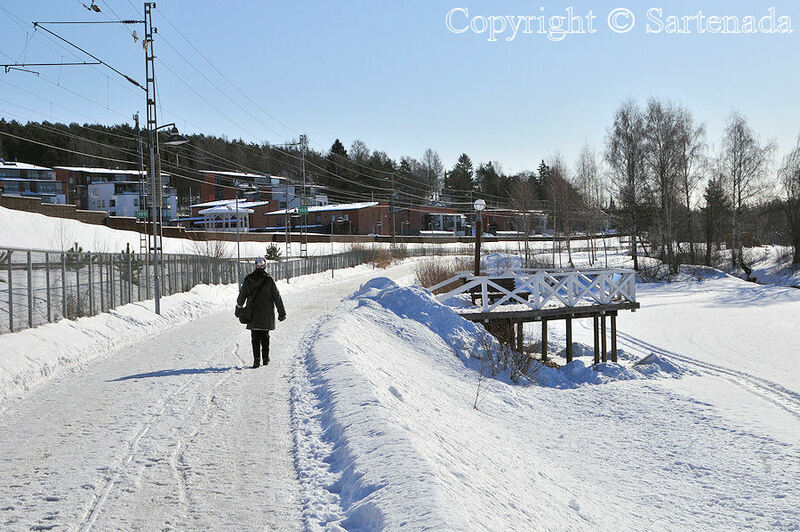 To reach Hämeenlinna is easy from Helsinki by train which lasts only one hour and three minutes. The trip from my home takes 40 minutes by car. Our walking tour took about one hour and 10 minutes with all the photographing stops, enjoying some nice cup of coffee from our thermos bottle and eating some sandwiches. 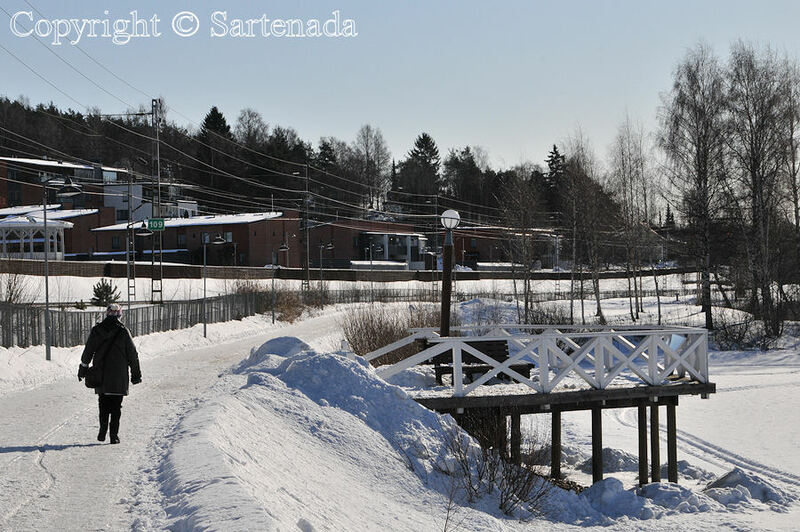 We were lucky on that sunny Saturday on March 03th in 2012, because it was sunny day. 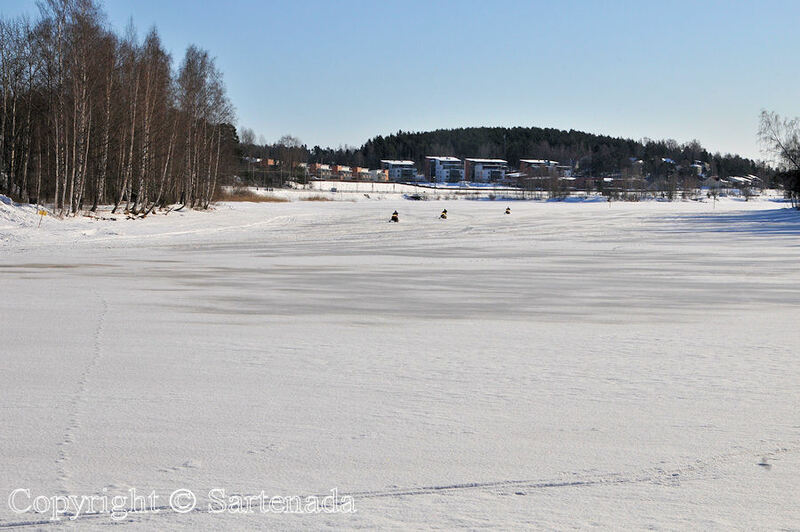 Caminando a la orilla otoñal del lago Vanajavesi en Hämeenlinna en invierno. 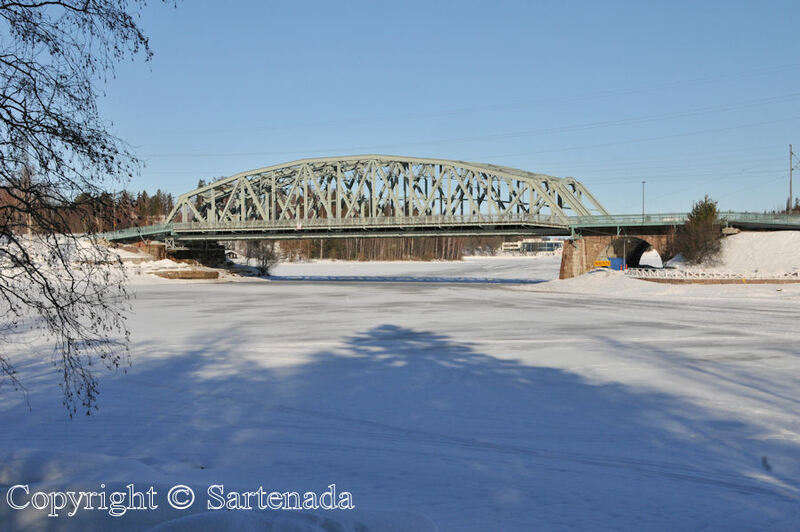 A mi me encanto visitar en Hämeenlinna muchas veces durante el año. 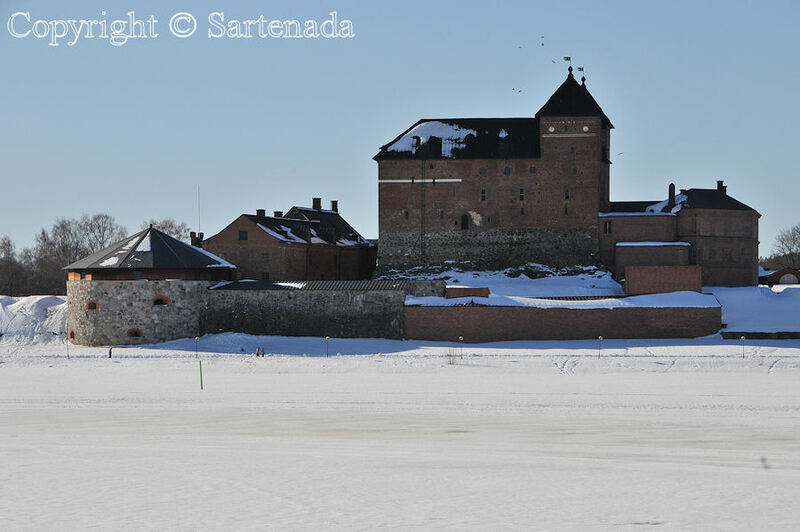 Hämeenlinna es famosa por su castillo rojo medieval de ladrillo (Castillo de Häme) que domina la vista general de esta pequeña ciudad. 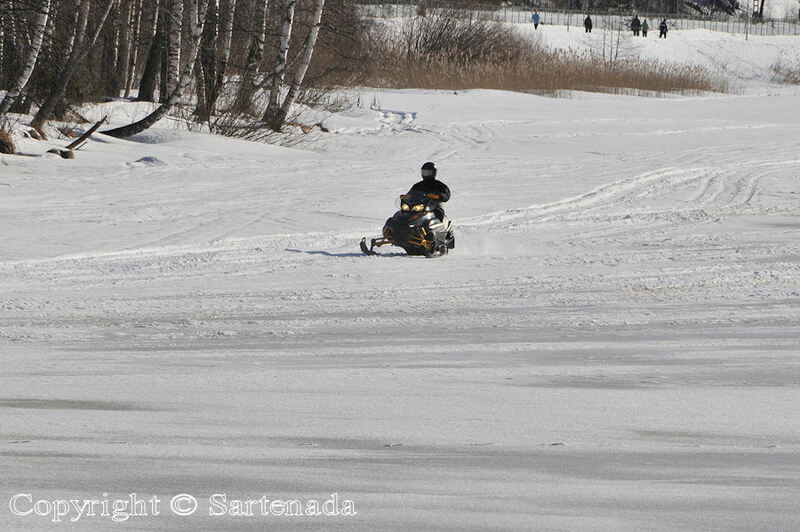 Se puede caminar por una agradable pista / sendero que pasa alrededor de pequeña parte del lago de Vanajavesi. Muchas personas corren o caminan en este paisaje, algúnos disfrutan simplemente de la belleza del paisaje con vista de lago del castillo. Para llegar a Hämeenlinna es fácil desde Helsinki viajande en tren que dura sólo una hora y tres minutos. El viaje de mi hogar toma 40 minutos en mi carritoazul. Nuestro paseo tomó aproximadamente una hora y 10 minutos con todas las paradas de fotografía, disfrutando de algún café rico de nuestra botella de termo y comiendo algunos bocadillos. Tuvemos suerte porque el Sábado 3 de Marzo 2012 era día soleado. 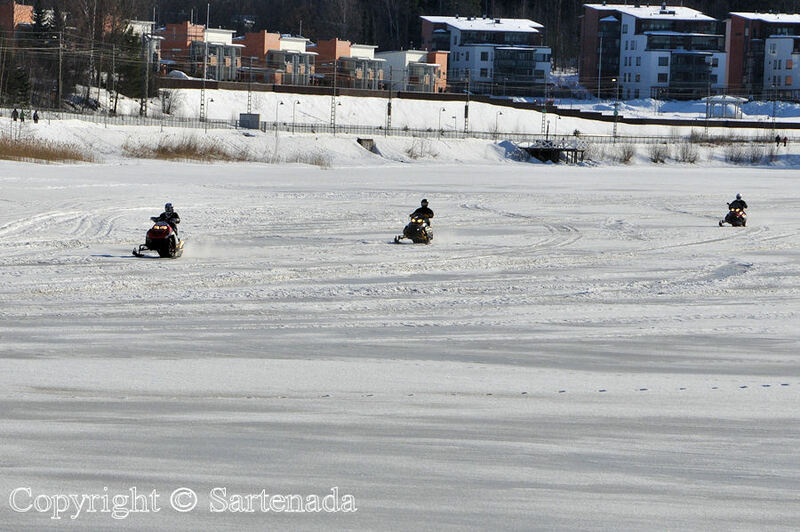 Déambulant sur la rive hivernal du lac Vanajavesi à Hämeenlinna. J’aime visiter á Hämeenlinna plusieurs fois pendant l’année. 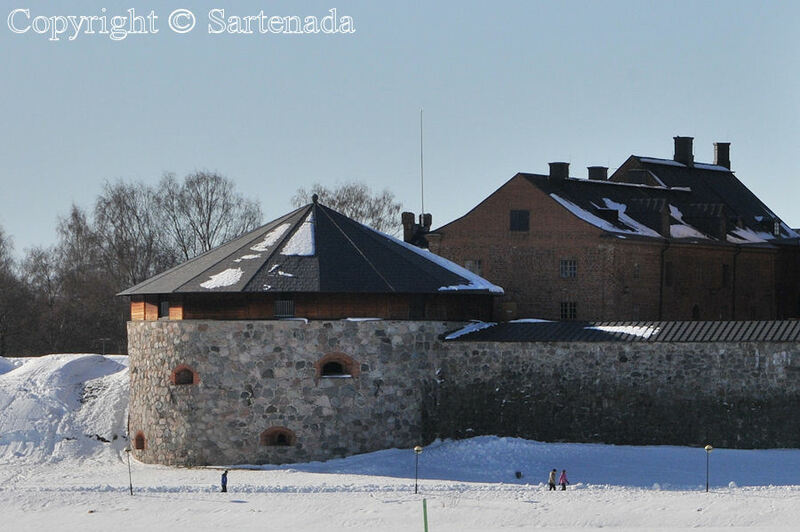 Hämeenlinna est célèbre pour son château de brique rouge médiéval (Château de Häme) qui domine la vue générale de cette petite ville. 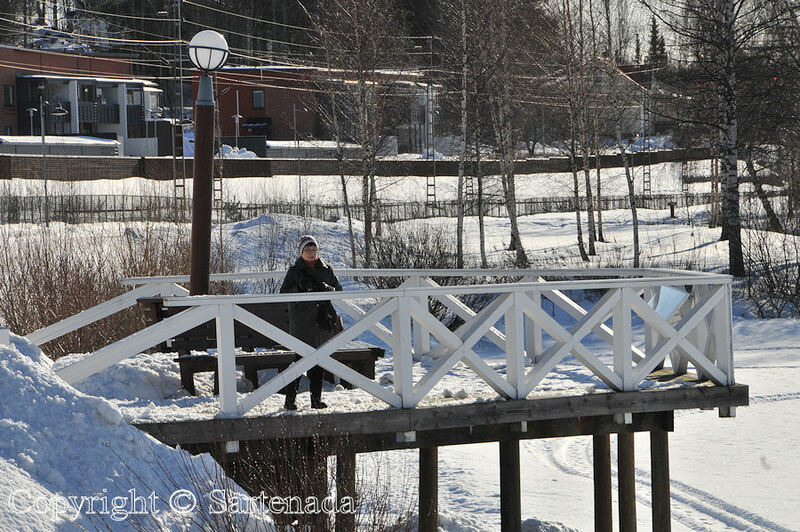 Il y a une piste agréable de promenade / le chemin qui passe “autour” de la petite partie du lac de Vanajavesi. Beaucoup de gens courent ou déambulent dans ces paysages, quelques apprécient simplement la beauté du paysage avec la vue de lac et du château. Pour atteindre Hämeenlinna a facile d’accès de Helsinki en train parce que le voyage dure seulement une heure et trois minutes. Le voyage de ma maison prend 40 minutes en voiture. Notre randonnée à pied a durée environ une heure et 10 minutes avec tous les arrêts de photos, goutant quelque tasse savoureuses de café de notre bouteille de thermos et mangeant quelques sandwichs. Nous avonsi eu la chance de parce que ce samedi 03 mars 2012 parce que c’était une journée ensoleillée. My Internet provider did not keep their promises, so I had to terminate the contract with them and to make a bargain with another Internet service provider. Now I am contacted using my 4g mobile broadband USB modem for my connection. Works ideally so far. This makes me want to travel right now! Awesome photos!! That was so nice to read Your comment. Thank You. These are amazing photographs. It looks incredibly cold there. I’m glad to hear you’ve sorted your internet problems. I hope it goes well for you now. Sending blessings for a joy-filled, peaceful Christmastime. Thank You. Well, it was not so cold although it looks so, because in Spring sun starts to warm causing that snow and ice start to melt. To us it was nice short trip and we enjoyed the life. Thank You very much for Your kind words. I feel happy myself happy when reading Your comment. Thank You. I am glad that You commented my winter post. 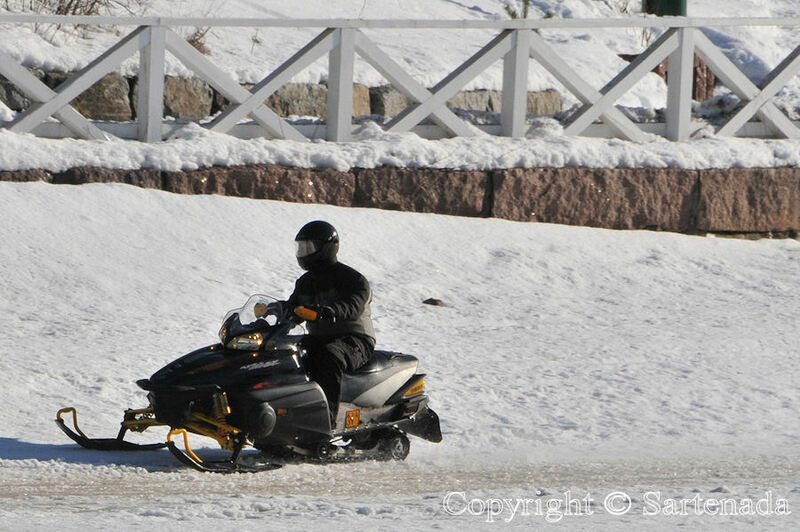 What great “sunny day” photographs of your trip and the snow. 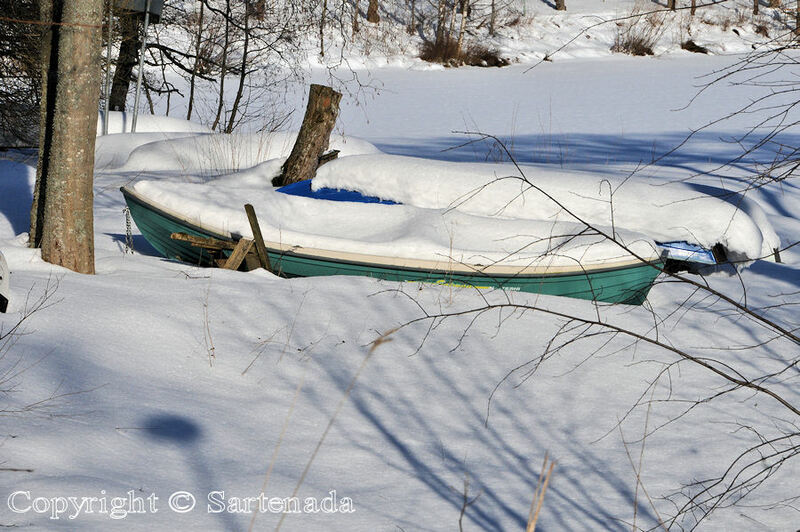 I especially like the rowboat in the snow. Thank You commenting. 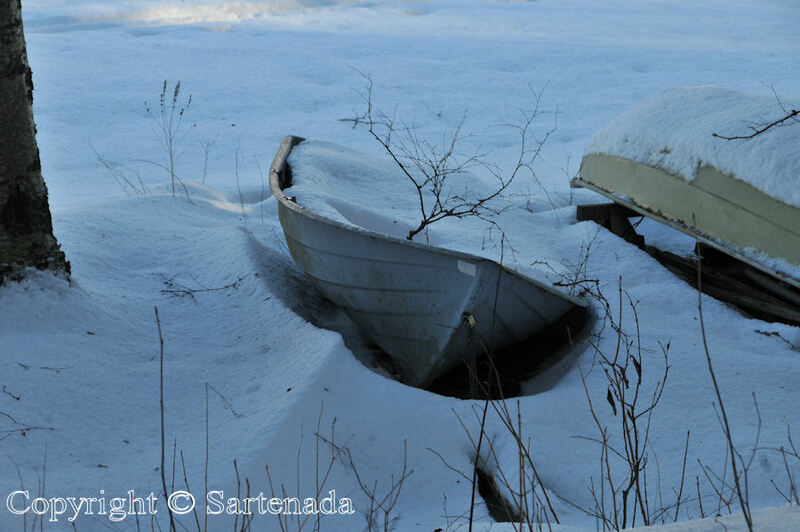 Rowboats in the snow were to me lovely to see. In our new home we have a lake view and next summer we hope to see a plenty of them. Hello Sartenada. Lovely photos as always. It is nice to see people next to the castle to show how giant the castle really is. Also, I notice the ice fisherman, like we also have in Minnesota. What kind of fish is caught in the lakes there? Have an awesome day! Thank You. 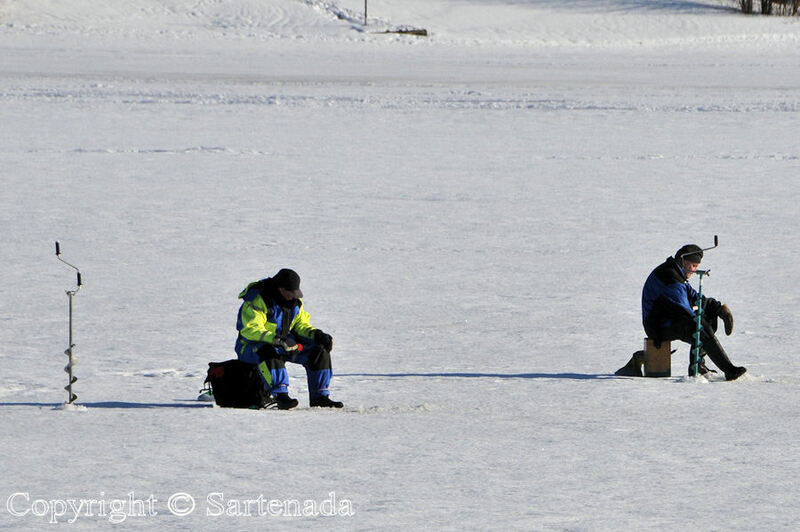 It was interesting to read that fishing on lakes is common in Minnesota. What kind of fishes there are in this lake, I cannot name exactly, but generally there are perches, pikes, breams, vendaces, bleaks, carps, eels, whitefishes and roaches for example. One of the best is “needle vendace”. I do not know if is in Minnesota. Very interesting that there are similar types of landscapes are on both continents. Thank You visiting my post and leaving so nice comment. We are and thank you. The green grass, hidden under last Sunday’s snowstorm has reappeared!! 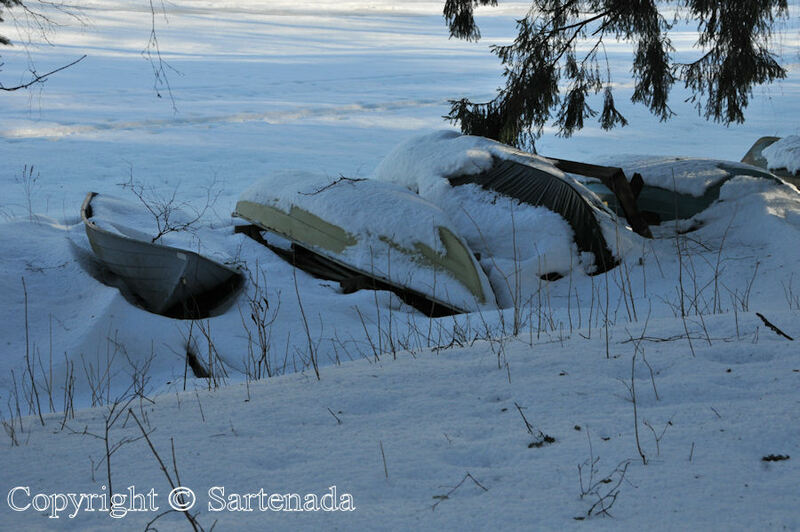 A little white remains in the roadside ditches only!! I guess that You are right about the weather. Tank You leaving Your comment. Just beautiful, especially the rust colored trees. Thank You. I am glad that You did find something interesting to You from my winter post. 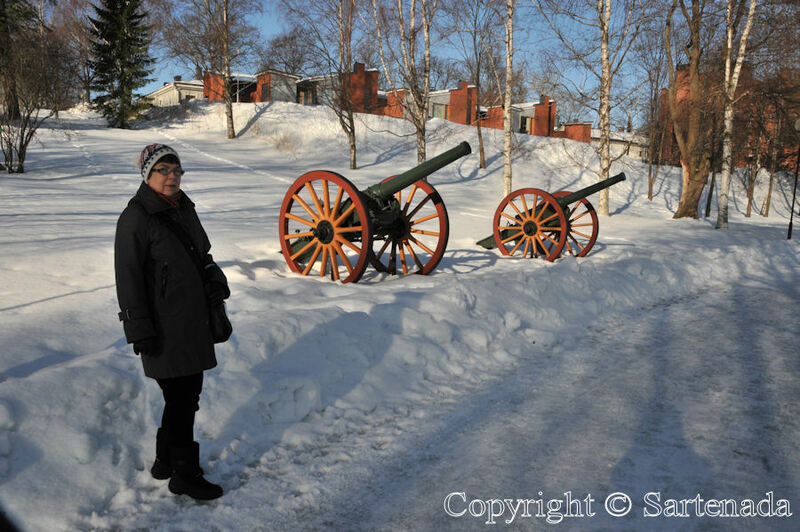 Very nice pictures, Matti. Even though I don’t like the snow that much – I like looking at snow from the inside or just at pictures, and your pictures actually make me yearn for it just a little. Thanks for sharing. Thank You. 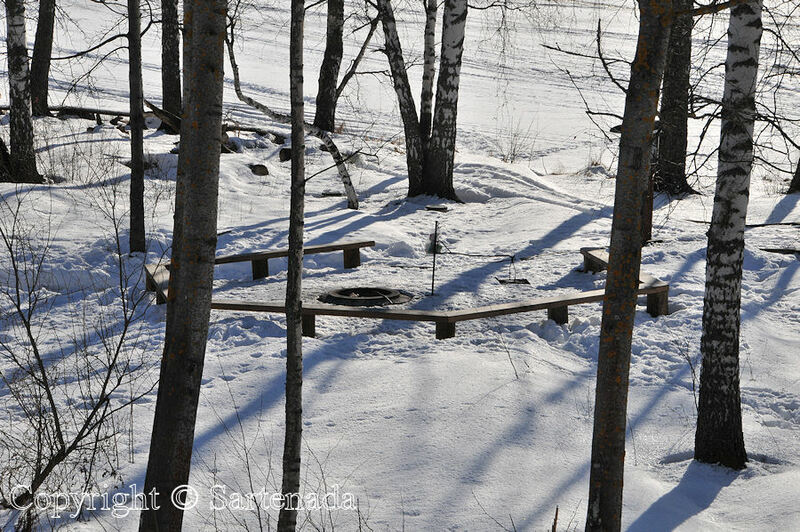 Well, You saw in my pictures how our spring is in the middle of March. Spring is beautiful season. When having real four seasons our nature has also four faces. It looks cold, but the sunshine is energizing. I’m sorry to hear about your internet service problems, but I’m glad you were able to share these beautiful pictures with your new provider. You had a beautiful day for your walk around the lake. The new snow is gorgeous. The red brick castle is very impressive. Since yesterday my Internet problems are history fortunately. 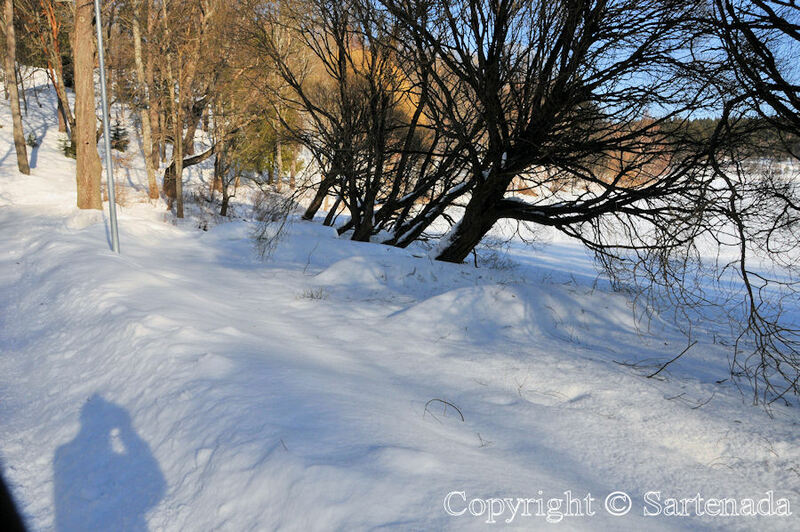 I am happy that You did like my winter photos from our walking trip. It’s good that you solved your internet problems! That’s a very pretty place in winter. 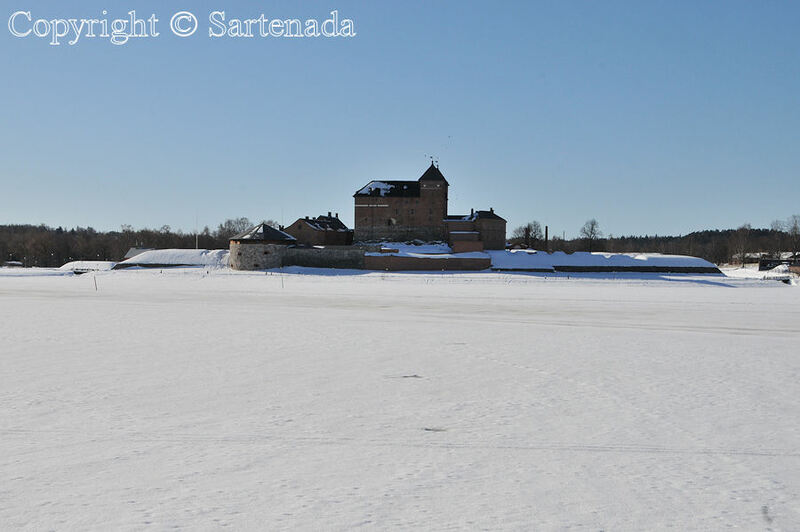 I be that old castle was a cold place to be in winter long ago! Yes, we feel happy ourselves now when our problems are over. This place is worth for multiple visits and as we love walking in the nature this was a natural selection for our walking tour. Thank You. Oh to have snow down here in Australia where the temperatures are in the 30’s. I feel cooler just looking at your beautiful photos. You are used to resist warm and we are used to resist cold here in Finland. I am happy that You checked my posts and left Your comments. Thank You. I love seeing winter through your camera. 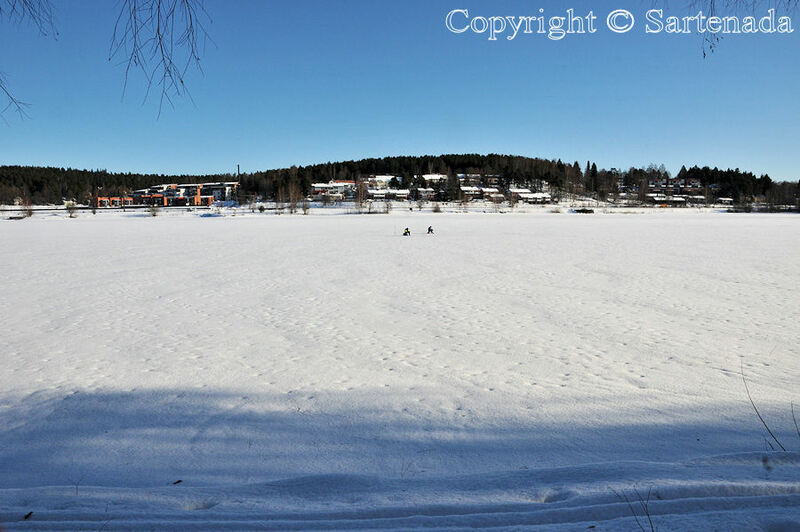 Are the people ice fishing in the first photos? Yes, they are indeed. 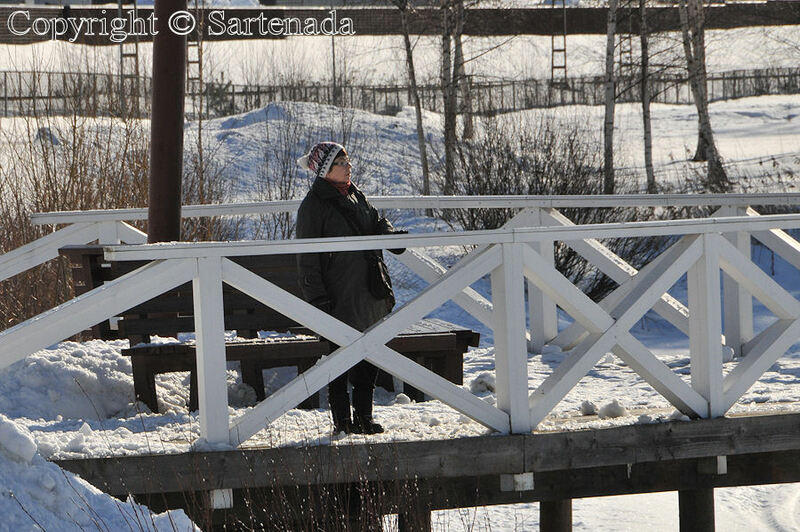 I feel happy when You visited my post and liked my winter photos. Thank You. Une belle promenade qui incite à la réflexion et à des pauses bienvenues autour d’une tasse de café ou de chocolat chaud. Très beau paysage hivernal. 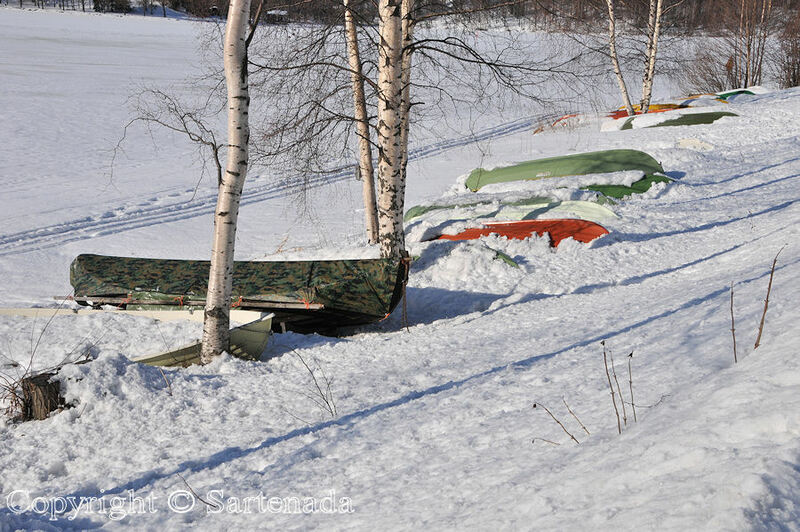 J’aime les barques qui se reposent dans la neige en attendant le printemps 😉 Merci Matti. Merci á toi! Hier, nous avons fait une longue marche á pied dans notre petite ville nouvelle où nous vivons maintenant depuis ten days. Il faisait vraiment froid avec un vent fort, mais heureusement l’homme a inventé de bons vêtements! Comme tu as mentionné, nous avons pris une belle tasse de cacao dans un centre commercial cette fois. Thank you. Winter is beautiful season, but I love warm. Well, let’s up hope that You can enjoy snow also there. I am happy that You like my snow and ice photos. More are coming next Friday presenting Helsinki light show last year. How happy I am, when reading Your comment. Thank You. I am glad that You love winter wonderland, although it might be cold from Your point of view. Thank You. Oh, I see. Although winters are hard, to see four seasons around the year is an experience which are worth to watch, to listen, to smell and thus to have experiences with all of them. Thank You giving additional info about Your life and of course commenting here. So beautiful to see the snow! 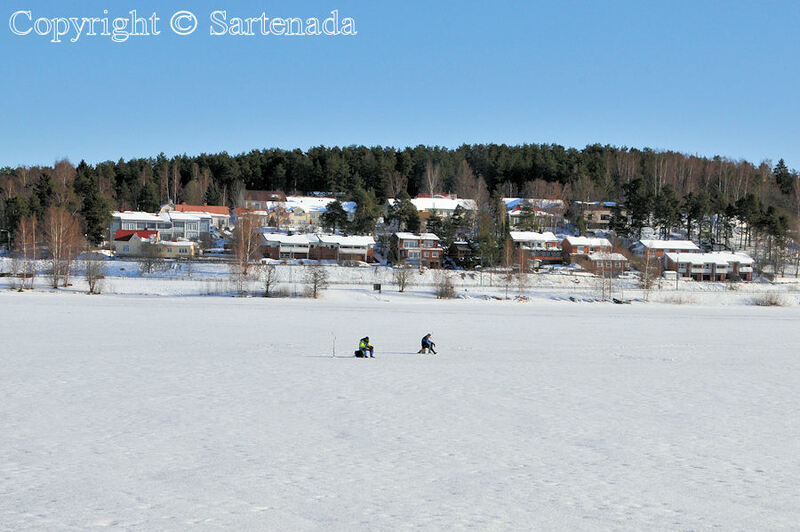 Loved the pictures of the ice fishermen! 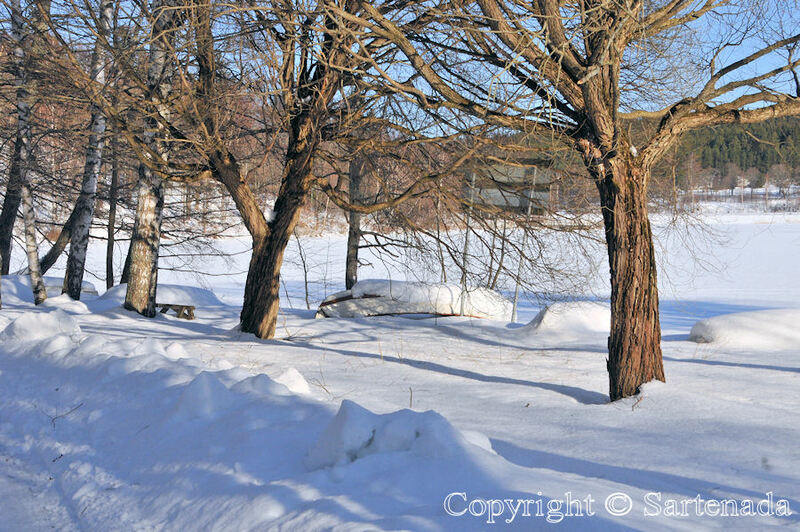 I enjoyed Your comment and I am happy reading that You loved to see snow. Thank You commenting. 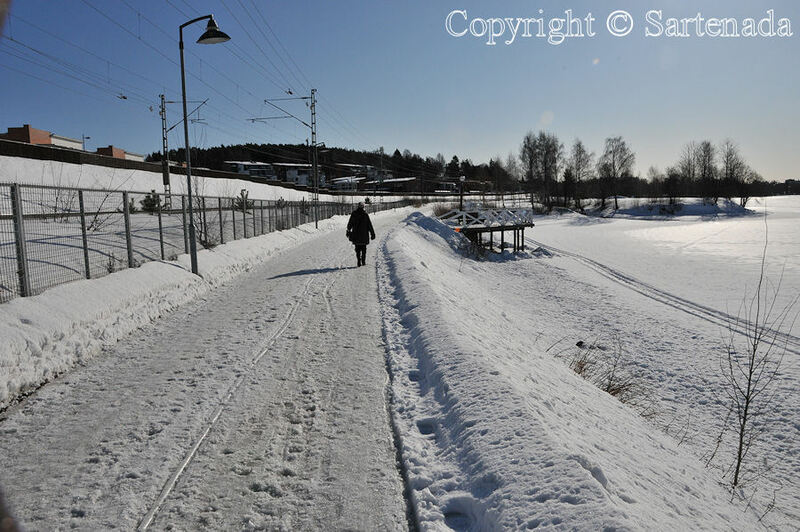 Oh yeah, it was a great fun to make this walk in winter wonderland. Thank You for Your comment. I believe it is connected to you somehow? I would be most interested in finding out more about the person who makes these wonderful miniatures of the tapulis. How do I get in touch with him/her? Where is this artist located? I had been hoping that someone out there would actually make such miniatures, and now the hope came true! Please, tell me all about this artisan. Ja sitten vaan Hyvää joulua! What comes to the link You gave, You are right by finding a connection with me. I have already forgotten that when I started to make home pages, I made that, so it is indeed me. I’ll write to You after Christmas and tell more. Please, do tell me more about this artist when you have time. I really want to visit his shop on my next visit to Finland. (I dohope he is still working.) And thank you for sharing the Christmas card post, as well. 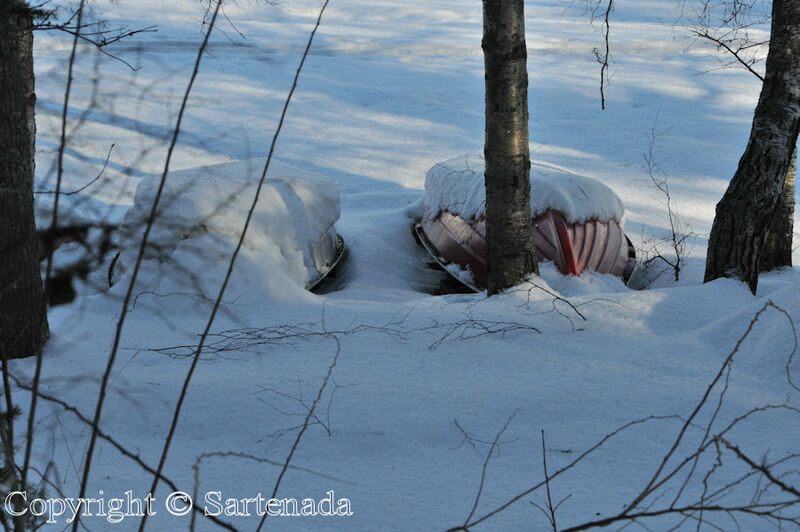 What sweet memories of warm childhood Christmases in the backwoods of Finland come to mind! Thank you! And have a Merry Christmas! I sent a letter to You. Brrrrrr. 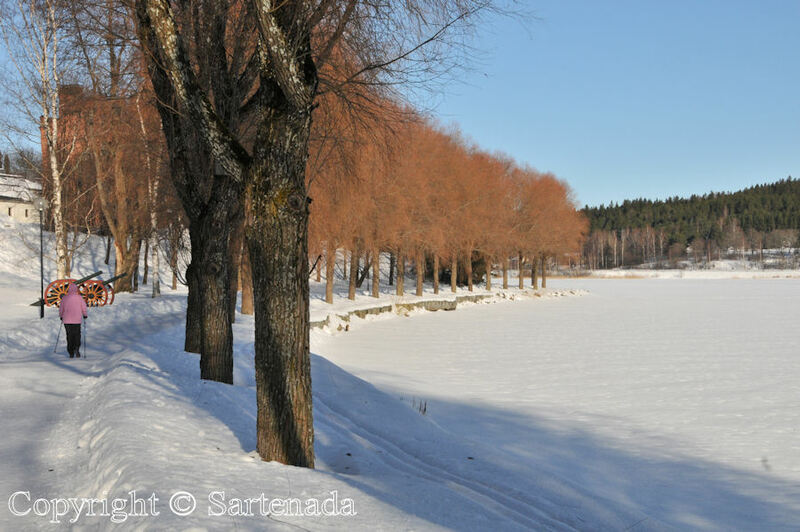 I can almost feel the cold through your vivid and beautiful photographs of Lake Vanajavesi. I enjoyed the winter tour very much! I appreciate Your comment very much and at same time I feel happy when reading it. Thank You. It’s beautiful, but it sure looks cold! Thank You. I am happy that You visited my site made Your comment. 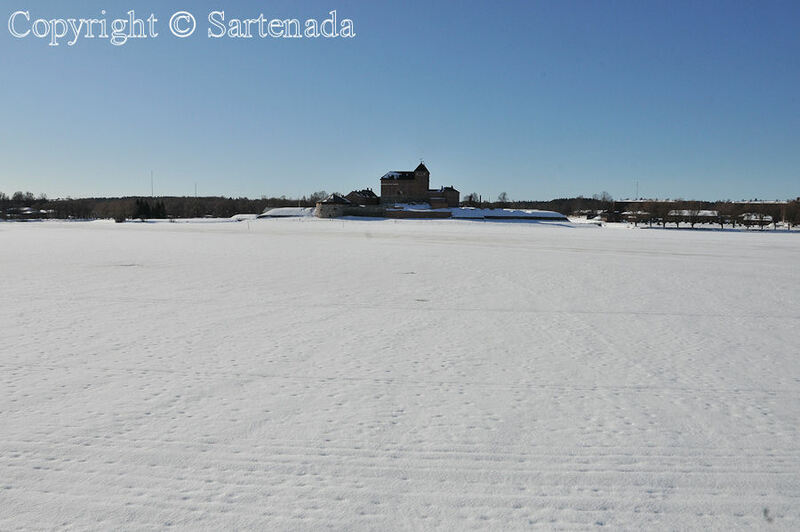 What a beautiful day and what amazing scenery … the castle is right out of a picture book and the people ice-fishing, walking, and driving ski mobile shows that people can still great pleasure in enjoying the winter even if it is freezing cold. Great Photos. I am very glad that You did check this post. 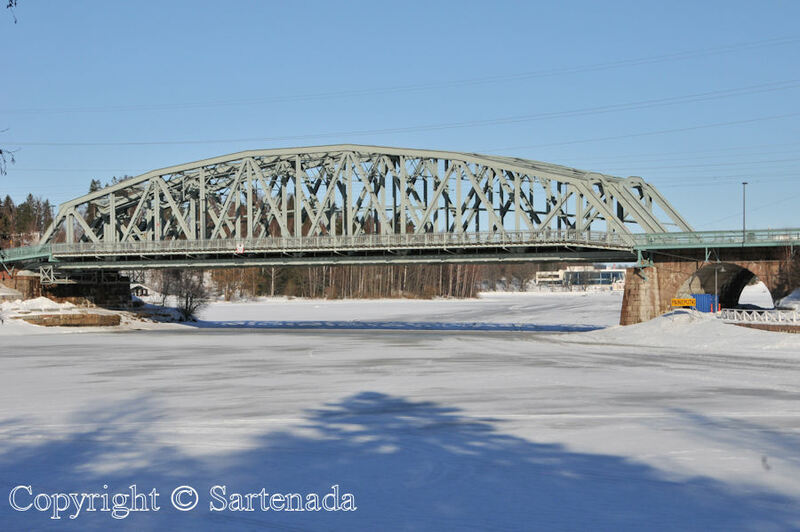 Although, Hämeenlinna (four posts) is a small town, it is beautiful.